Trump won as the anti-Clinton. Here's why it might fall flat in 2018. 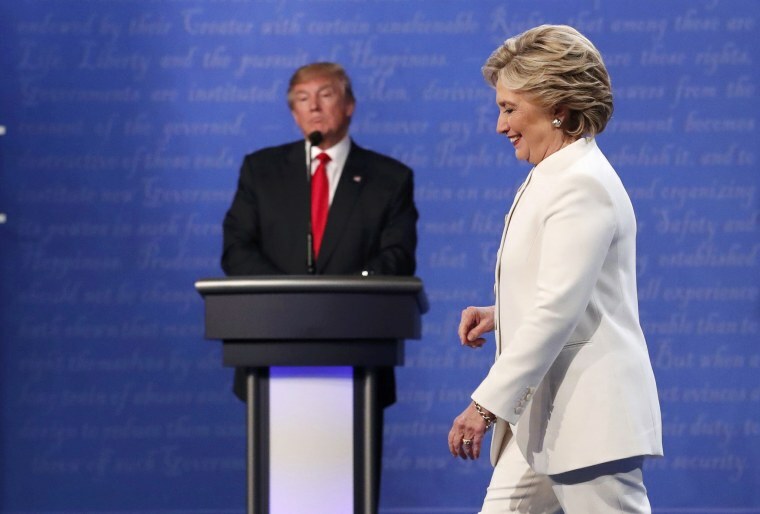 WASHINGTON — One of the keys to President Trump’s victory in 2016 — and to his overall political survival — has been to claim, essentially: “Hey, I’m not Hillary Clinton.” Indeed, voters who disliked BOTH Clinton and him ended up siding with the Republican in 2016. But that talking point doesn’t work for Trump anymore, even as Clinton remains highly unpopular, according to the latest NBC/WSJ poll. NBC/WSJ co-pollster Bill McInturff (R) says that the bipartisan disapprovers are clearly different voters between 2016 and now, but it’s also clear that they won’t be Republican voters in 2018 – and maybe beyond. The latest NBC/WSJ poll also shows Republicans regaining their lead on which party better handles the economy (after losing it in December), while Democrats are ahead on health care, immigration and Russia. While Republicans lead on the economy and taxes, the NBC/WSJ finds Trump’s tax law remaining unpopular. In the survey, 27 percent of Americans believe the tax law is a good idea, versus 36 percent who think it’s a bad idea (-9). Back in January — a month after the legislation was signed into law — it was 30 percent good idea, 38 percent bad idea (-8). And when the survey asks a more detailed question about the law, the Democratic messaging is more popular than the GOP messaging: 53 percent see the law as more of a negative because it increases the federal deficit and mostly benefits the wealthy and big corporations, while 39 percent see it more as a positive because it improves the economy, increases jobs and gives average Americans a tax cut. “President Trump on Monday put the brakes on a preliminary plan to impose additional economic sanctions on Russia, walking back a Sundayannouncement by U.S. Ambassador to the United Nations Nikki Haley that the Kremlin had swiftly denounced as ‘international economic raiding,” the Washington Post reports. If it was just one or two examples of Trump displaying cozy behavior with a geopolitical adversary, then you could dismiss it as a coincidence. But it’s not just one or two examples. By the way, the new NBC/WSJ poll finds a whopping 74 percent of Americans believing Russia is more of an adversary than an ally, compared with 54 percent who say the same thing about China. “Sean Hannity, the Fox News host who has been waging war on the air against special counsel Robert Mueller and is an outspoken advocate for President Donald Trump, was revealed Monday as one of only three clients that Michael Cohen, the president's personal attorney, had during 2017 and 2018,” per NBC News.